Everybody will be sad to hear that a mature Cedar tree near St. Chad's church is due to be felled in a few days time. In November the District Council's tree experts (arboriculturalists) tried to save this tree by suggesting certain limbs be trimmed and braced. In January, following further limb losses, the arboriculturalists decided that the tree could not be saved and recommended that it be removed and replaced. Members of the Parks Friends Group have challenged this decision. It has been explained to us that trees rely on an intact canopy to deflect strong winds. 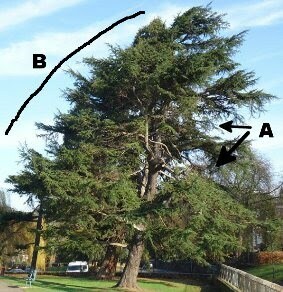 In the image on the right the left hand side of the tree, marked "B", shows this quite well. In contrast the crown of the tree on the right hand side, marked "A", has been exposed by previous limb loss and is very vulnerable to futher damage in gusty conditions. The District Council's arboriculturalists said that they would not have agreed to the felling of the tree if they thought there was a realistic prospect of the crown regrowing and filling in the gaps. In their opinion the age of the tree and damage from previous limb loss and from tree surgery makes this unlikely. This unfortunately means that the best solution is felling and replacement. Creative Commons Attribution 2.0 License.